Ron Paterson has been a Lecturer / Senior Lecturer at the Faculty of Law 1986–99 and Professor of Law since 2010. He is Distinguished Visiting Fellow at the Melbourne Law School. His career has been spent in tertiary education and in public service roles. Ron was a Deputy Director-General of Health 1999–2000, Health and Disability Commissioner 2000–2010, Chair of the Banking Ombudsman Scheme 2010–13, and Parliamentary Ombudsman 2013–16. 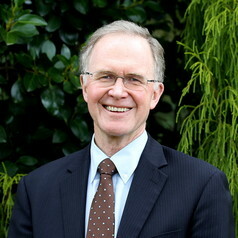 With law degrees from Auckland and Oxford Universities, Ron has held Fulbright and Harkness Fellowships, in biomedical ethics and health policy. He has researched and lectured in the United Kingdom, the United States, Canada and Australia, and is an international expert on complaints, healthcare quality and the regulation of health professions. Ron has undertaken several major Health reviews in Australia and New Zealand. He is co-editor of Health Law in New Zealand (2015) and author of The Good Doctor: What Patients Want (2012). Ron was awarded an ONZM for services to health in 2011, and made an Honorary Fellow of the Royal Australasian College of Physicians in 2014.